Developer: ADRIATICO GRAND REALTY CORP. Located just across Robinsons Place Manila, ADRIATICO GRAND RESIDENCES, a t win-Tower, 27-Storey Residential and Commercial condo, is truly at the center of Ermita and Malate’s pulsating landscape. Strategically located along Adriatico Street, between Pedro Gil and Padre Faura, bounded by 3 street corners--- Adriatico, Romero-Salas and Sta. 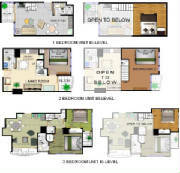 Monica, it is easily the most ideally located condo in Ermita and Malate. Shopping is a breeze with Manila ’s largest shopping mall, Robinsons Place Manila , literally just across the street! After work hours, going to bars and restaurants has never been more convenient, with popular recreation centers and night spots within a few minutes away on foot. On top of the great location, ADRIATICO GRAND RESIDENCES also has the enviable front-seat view of the spectacular ManilaBayvista from its units.